This work on Isaiah’s teachings is designed to help students of the scriptures increase their understanding of the words of Isaiah. It started out as being notes for our family scripture study and has grown over the past few years. Isaiah's writings persuade us to believe in Christ and they give hope to us in our day (see 2 Nephi 19:23-24). 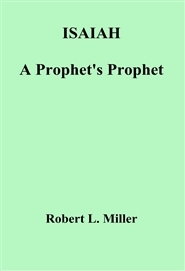 I have included the words of modern-day prophets and apostles that help us to understand the great prophet Isaiah by adding clarification, guidance, and encouragement in our study. This is a second draft and I am working on a final draft for wider publication.